Joan Hoye came into the store today, as did many others. What is special about Joan? Joan is a lace knitter and a wonderful silversmith. 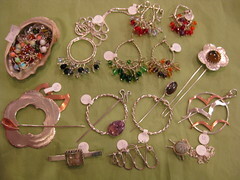 She makes our beautiful stitch markers and shawl pins and other knitting themed jewelry. Joan has been making silver jewelry for quite a few years and has been selling the knitting themed items at Mad About Ewe for about 5 years. I have a large collection of markers and pins! Joan also makes her jewelry to order. 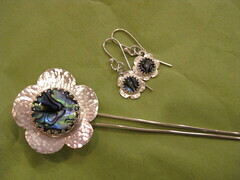 A few months ago Joan brought a beautiful flower stick-pin to the store. It has a tiger eye center. Tiger eye (golden browns) is not my colour so I asked her to make me a similar pin with something in my colour for the center. A few weeks later she showed me some PauPau shell, it was perfect! I asked her if she could perhaps make some earings – sure, no problem! Big Problem!! – for me! So yesterday Joan came into the store with my new pin and earings. They are beautiful. And you can see my problem, I just want more! » Uncategorized » Dangerous Goods!